Excicata recolectada por el Hermano León. Foto: Yusimí Alfonso..
Tanzania; detail. Eurico Oliveira. © Eurico Oliveira (euricodo@usp.br). Published in: Montagne, C. (1837). Centurie de plantes cellulaires exotiques nouvelles. Annales des Sciences Naturelles, Botanique, Seconde série 8: 345-370. Adjective (Latin), fastigiate, with branches clustered, parallel and erect, giving a narrow elongated habit (occasionally meaning branched reaching to the same height) (Stearn 1973). 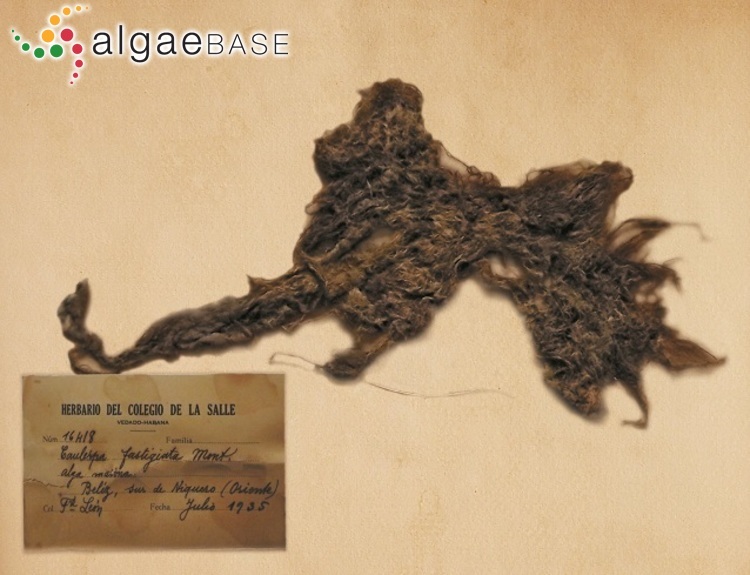 Lawson & John (1987) cite this as Caulerpa fastigiata Montagne, 1842. Type locality: Cuba (Lipkin & Silva 2002: 63). Type: Ramon de Sagra; PC (Lipkin & Silva 2002: 63). Copertino, M., Connell, S.D. & Cheshire, A. (2005). 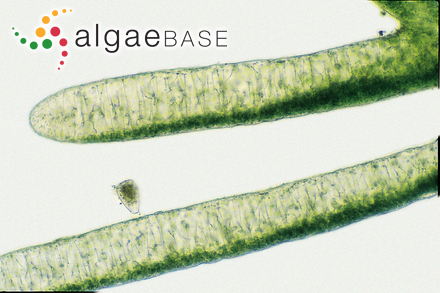 The prevalence and production of turf-forming algae on a temperate subtidal coast. Phycologia 44: 241-248. Accesses: This record has been accessed by users 4128 times since it was created. Thivy, F. & Visalakshmi, V. (1966). On Caulerpa fastigiata Mont. var. fastigiata in India. Journal of the Bombay Natural History Society 62: 434-439, 2 plates.